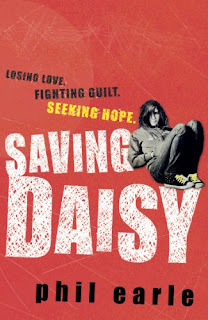 Saving Daisy is one of the books I have been looking forward to for month now and I am pleased to say it lived up to all expectations and I enjoyed it as much, if not more than, I enjoyed Being Billy. The thing I loved about this book the most was Daisy. She is so brilliantly raw and realistic. I could see so much of her in kids I teach. She's this fragile bundle of emotional damage wrapped up in an overwhelming amount of guilt. As you follow her through all the various things she goes through your heart goes out to her and you just want to pick her up take her home and wrap her in blankets, feed her chocolate and tell her everything will be ok.
Daisy's life turns upside down after the accident, which she feels completely responsible for, and leaves her totally alone. After a stint in hospital she ends up in a home for other teenagers with issues. The characters you meet are larger than life and the way in which they react to and interact with Daisy are brilliantly entertaining to read about. Once at the home Daisy meets Ade and she slowly becomes the adult that finally starts to get through and starts to help saving Daisy from herself and finally starts to bring her round to the idea that all the things she blames herself were not actually her fault. I loved that she had real insight to help Daisy having lived a turbulent younger life herself. A brilliant read with a main character which your heart goes out to. A real emotional ride which touches you and tears you between feeling heartbroken for daisy through to feeling warm and fuzzy inside for her as things finally work out. Highly recommended. It definitely is an amazing book. Phil Earle is a very talented writer. I thought Being Billy was fantastic. Must get a copy of this. I've seen a lot about this book recently and it sounds really good. Might have to pick up a copy.